In which we unearth Wax of the Wild West and the Legend of “Gunplay” Maxwell. From Colonial America and treacly Christmas traditions, the wax train I was on swiftly traveled to the Old West and a classic high noon shoot-out. It seems just like America, wax and its origins are nothing if not diverse. So off with the Puritan garb, on with the mining hats and holsters, and into the wax mines of Utah. The ozokerite is found in the shales and sandstone with oil and salt water. The mining is all done by shaft work, and at the time of my visit was at a depth of about 800 feet, since that time they have gone down to a depth of 1,400 feet in shaft mining and about 3,000 by drilling.¶ The wax, as extracted, comes in a brecciated form, mixed in shale and sandstone. The lump form of wax, as a rule, is soft, and is something like butter half way hard. Part of this wax oozes into the drifts from the crevices in the walls and fills up the drifts charged with oil and gas. Sometimes this exudation of wax comes so suddenly that the miners have to leave the mine, and afterwards the oil has to be pumped out. At one time a large body of this soft wax, called at the mines ‘Blassen Wachs’ (Blow Wax) filled the drifts, shaft and house, over night, to a depth of 800 feet. Kroupa also described the initial refinement process, which sounded familiar. Wax is wax. Throw it in a tub of hot water, hot enough to melt it, and the wax rises to the top as the dregs fall away. All the wax hauled from the shafts is sorted and the brecciated matter is placed in large cast iron caldrons containing hot water. The wax was skimmed from the surface, remelted, and cast into wooden tubs. Higgins described ozokerite as “a residue formed by the receding of oil from the fissures, leaving a certain amount of paraffine in the cracks and crevices … ” which leads one to wonder: Is ozokerite the same as paraffin? Well, yes and no. Whichever series, ozokerite has a melting point ranging from 154 to 190 degrees, much higher than the commercial paraffins of the time, which, according to Higgins, had melting points no higher than 130 degrees. The uses of ozokerite, as listed by Higgins and Robinson, included everything from helping to create phonograph records to waterproofing surfaces, to making wax paper and dolls, and, of course, candles. Robinson: “Candles made from ozokerite have qualities superior to those found in other candles.” Higgins: “The illuminating power of such candles is stronger than that of others, while they drip but little and never lop over when exposed to ordinary atmospheric heat.” Ozokerite also proved especially useful for insulating electrical wires, and it could be turned into a highly refined product called ceresin. Comparing the Utah to the Austrian ozokerite field even the layman can see the wonderful possibilities possessed by the former. At Colton, near which place almost inexhaustible deposits of ozokerite exist, the field is so extensive that an industry could be established that would make our state as noted and famous for the production of this commodity as it now is in its yield of gold, silver, lead, copper, coal and other minerals. The first prospecting of this region was done in 1886. Since that time mining and prospecting have been carried on at irregular periods, for litigation has prevented continuous development. Exact figures for the production of the field are not available, and at the time of the writer’s examination all the mines were inactive. Inactive mines, litigation, opportunity waxing and waning. Enter “Gunplay” Maxwell. Gunplay, born in or near Boston in or near 1860, was thought to be an educated, intelligent man, but he spent most of his life robbing banks and stage coaches, stealing cattle, getting in gunfights, shooting folks, getting caught, spending time in prison, trying to get in with Butch Cassidy’s Hole-in-the-Wall Gang, shooting morphine or some such into the veins of his arms, drinking, gambling, marrying (whether or not he was already married), changing his name (everything from James Otis Bliss to William H. Seaman), and generally making his way through a somewhat messy life in the states of Wyoming, Utah, and Nevada. For a short while or two, Gunplay was a deputy sheriff. For another short while he was a mine guard for a Utah coal mining company whose workers were on strike and, as well, he was a bodyguard for the company’s lawyer—a man who became his lawyer and who subsequently helped Maxwell dodge a bullet or two, so to speak. But Maxwell’s seemingly legitimate jobs always appeared to have angles attached to them that helped his illegal pursuits. From what I’ve read, I would say he was a dirty, double-dealing, scheming kind of guy. He died in 1909 around 50 years of age after being challenged in a saloon. There was a gunfight in the middle of the street. Maxwell was shot dead. Whether it was high noon or not, I do not know, but certainly it is possible. These Wild West tales do seem to get a little … wild. How Maxwell found time to become a founder of the Utah Ozokerite Company, I don’t know, but by all accounts he did. Here’s a notice from Mineral Wealth, Vol. 6, March 1, 1905 (page 164). The Utah Ozokerite Company, has been incorporated with a capitalization of 300,000 shares of $1 each. The incorporators are C. W. Shores, Grand Junction, Colorado; C.L. 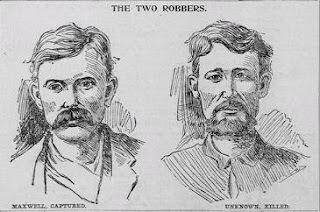 Maxwell, Scofield, Utah; B.F. Caffey and H.A. Nelson of Salt Lake, Utah. The company will mine mineral wax and ozokerite near Colton, Utah. The company’s headquarters will be at Salt Lake. In some instances the walls are almost as smooth as glass, and can be followed for considerable distances before a break is encountered. The veins are from three to thirty feet in width, and carry an average value of three per cent ozokerite. The ozokerite exists in the crevices and fissures in the vein matter, and is easily distinguishable, being a glossy black shading off into deep browns or a pronounced yellow. In places in the vein the ozokerite occurs in solid masses ranging from two to six inches, or even a foot in width. This requires to be melted to be rendered marketable, and is practically 100 per cent pure. [Ozokerite] cuts easily, somewhat like hard cheese, but does not adhere to the knife. Ozokerite Wax is generally a white, crystalline, odorless and tasteless solid. It is most often made from blends of paraffin and microcrystalline waxes and when combined offer broader functionality than the constituent ingredients and is used extensively use in personal care and cosmetic formulations. Poor Rover! will ye never have done with all this weary roving? where go ye now? 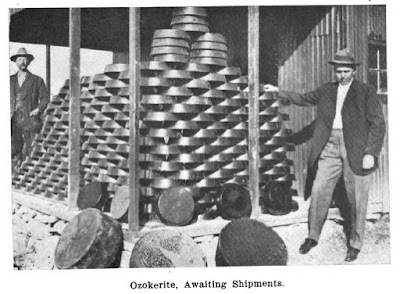 “The American Ozokerite Company,” Will C. Higgins, Eighth Biennial Report of the State Mine Inspector of the State of Utah 1911-1912. “Ozokerite in Central Utah” (US Geological Survey Bulletin 641, 1916), Heath M. Robinson. Who was that masked man?, D. Robert Carter, Daily Herald (Provo UT), June 3, 2006. Gunplay became a creative convict, D. Robert Carter, Daily Herald (Provo UT), June 10, 2006. Gunplay followed path of lawlessness to the grave, D. Robert Carter, Daily Herald (Provo UT), June 24, 2006. Jones Exhibit. (Sketch of life of C.L. Maxwell …), Industrial Relations: Final Report and Testimony, Volume 11, United States Commission on Industrial Relations, 1916. Gunplay Maxwell – Utah Gunfighter & Outlaw, Kathy Weiser/Legends of America, August 2017. C.L. aka John Carter “Gunplay” Maxwell on FindAGrave.com (includes an obituary attributed to The Garland Globe, September 4, 1909, Garland, Utah. Whispering Smith: His Life and Misadventures, by Allen P. Bristow, Sunstone Press, 2007. Mineral Wealth, Vol. 6, March 1, 1905. A Brief History of Mining in Utah, Burt B. Brewster, E. M., 1949. Utah wax miners reunite after 55 years, Caleb Warnock, Daily Herald, Jul 8, 2006. US Geological Survey Bulletin No. 285, “Ozokerite Deposits in Utah,” by Joseph A. Taff and Carl D. Smith, 1905.